A novelty at Tucson 2015. 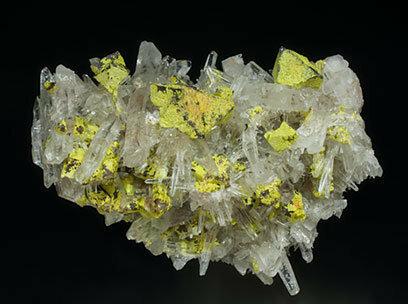 Very sharp dipyramidal Scheelite crystals that are coated by vivid lemon yellow Stolzite. They are on a matrix of Quartz crystals, a lot of them doubly terminated, with red Hübnerite inclusions.